Millau Viaduct is the world’s tallest bridge in southern France. when it opened on 17 december 2004, the spectacular millau viaduct set new standards in both planning design and construction – without mentioning the record it set as the largest cable-stayed bridge in europe. At 2.4km long, and 270m above the river at its highest point, the millau viaduct spans a 2km valley in the massif central mountain range and forms the final link in the a75 highway from paris to barcelona. Despite its huge length, journey time over the structure is expected to be just one minute. The road has two lanes in each direction and cost €400 million. this will be recouped by the builder, eiffage, under a 75-year concession. Check consciencedupeuple.com and have further idea about France’s best tourist attractions. Two major challenges were identified in building the structure: Crossing the river tarn, and spanning the huge gap from one plateau to the other. The solution proposed is unique, using seven pylons instead of the typical two or three. It is several metres taller than that other famous french landmark, the eiffel tower. The famous british architect Norman Foster was in charge of the Viaduct’s appearance. It has been designed to look as delicate and transparent as possible. Each of its sections spans 342m and its columns range in height from 75m to 235m over the river tarn. It uses the minimum amount of material, which made it less costly to construct: The deck, the masts rising above the road deck and the multi-span cables are all in steel. The seven piers of the Millau Viaduct are sunk in shafts of reinforced concrete in a pyramidal shape, being divided in an overturned v, and the shrouds are anchored and distributed in semi harps. the program utilised hundreds of high-pressure hydraulic cylinders and pumps to push-launch the deck spans in place and a pc-synchronised lifting system to lift the auxiliary piers. enerpac was awarded the major contract to supply the hydraulic system for lifting and pushing the bridge spans and piers for the bridge. construction began in october 2001, and by november the following year, the highest pier had already reached 100m in height. launching the deck started in february 2003, and was completed by may 2004. Unusually, the deck is constructed from a new high-grade steel as opposed to concrete. this helped the deck to be pre-constructed in 2,000 pieces at eiffage’s alsace factory and gps-aligned, 60cm at a time. 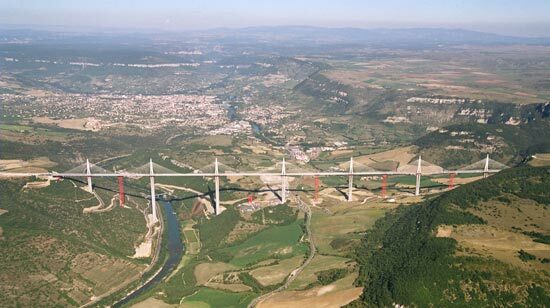 the millau viaduct is supported by multi-span cables placed in the middle. to accommodate the expansion and contraction of the concrete deck, there is 1m of empty space at its extremities and each column is split into two thinner, more flexible columns below the roadway, forming an a-frame above the deck level. Construction work used approx. 127,000m³ of concrete, 19,000t of steel-reinforced concrete and 5,000t of pre-constraint steel (cables and shrouds). the project needed 205,000t of concrete, of which 50,000m³ will be reinforced concrete. in total, the viaduct weighs 290,000t. A 3m-wide emergency lane provides increased security. it will, in particular, prevent drivers from seeing the valley from the viaduct. As the bridge will be exposed to winds of up to 151km/hr, side screens are used to reduce the effects of the wind by 50%. the speed of the wind at the level of the road therefore reflects the speed of the wind found at ground level around larzac and sauveterre. an 18-lane toll station 6km north of the millau viaduct is housed under a structure made of a special concrete patented by the group eiffage. the toll plaza includes a cctv connection to the viaduct and the highway. it also accommodates technical and administrative services.